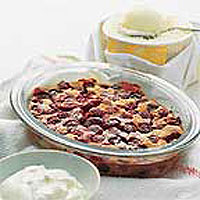 This pudding is based on a traditional French clafoutis. The addition of Hoegaarden, a wheat beer from Belgium, gives the batter a lightness and adds subtle notes of orange and coriander that work well with the cherries. Preheat the oven to 190ºC, gas mark 5. Lightly butter a 1 litre, shallow, ovenproof dish. Scatter the cherries over the base of the dish and sprinkle with 1 tbsp of the icing sugar and the orange zest. Mix the flour and remaining icing sugar in a bowl. Make a well in the centre of the mixture and add the eggs. Then gradually whisk in the beer, stirring all the time, to make a batter. Whisk in the crème fraîche and pour the batter evenly over the cherries. Bake for 40-45 minutes until the batter is golden. Remove from the oven and dust with a little icing sugar. Serve warm with a scoop of Waitrose Lemon Sorbet. When the cherry season is over, make this pudding with 300g Shearway Frozen Summer Fruits. There is no need to defrost the fruit - just add an extra 5 minutes to the cooking time. No choice here - it just has to be a chilled glass of Hoegaarden White Beer with its wonderfully refreshing citrus and ginger flavours.